Chronic overuse of common pharmaceuticals, e.g. acetaminophen (paracetamol), often leads to the development of acute liver failure (ALF). 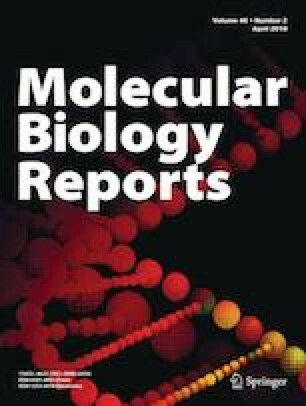 This study aimed to elucidate the effect of cultured mesenchymal stem cells (MSCs) proteome on the onset of liver damage and regeneration dynamics in animals with ALF induced by acetaminophen, to test the liver protective efficacy of MSCs proteome depending on the oxygen tension in cell culture, and to blueprint protein components responsible for the effect. Protein compositions prepared from MSCs cultured in mild hypoxic (5% and 10% O2) and normal (21% O2) conditions were used to treat ALF induced in mice by injection of acetaminophen. To test the effect of reduced oxygen tension in cell culture on resulting MSCs proteome content we applied a combination of high performance liquid chromatography and mass-spectrometry (LC–MS/MS) for the identification of proteins in lysates of MSCs cultured at different O2 levels. The treatment of acetaminophen-administered animals with proteins released from cultured MSCs resulted in the inhibition of inflammatory reactions in damaged liver; the area of hepatocyte necrosis being reduced in the first 24 h. Compositions obtained from MSCs cultured at lower O2 level were shown to be more potent than a composition prepared from normoxic cells. A comparative characterization of protein pattern and identification of individual components done by a cytokine assay and proteomics analysis of protein compositions revealed that even moderate hypoxia produces discrete changes in the expression of various subsets of proteins responsible for intracellular respiration and cell signaling. The application of proteins prepared from MSCs grown in vitro at reduced oxygen tension significantly accelerates healing process in damaged liver tissue. The proteomics data obtained for different preparations offer new information about the potential candidates in the MSCs protein repertoire sensitive to oxygen tension in culture medium, which can be involved in the generalized mechanisms the cells use to respond to acute liver failure. The online version of this article ( https://doi.org/10.1007/s11033-019-04765-z) contains supplementary material, which is available to authorized users. Acute liver failure (ALF) caused by the intake of common pharmaceutical drugs is a well-known clinical problem worldwide. There are two major cases when the ALF can emerge in an individual. First, if the person taking the drug in therapeutic doses belongs to the group of so called “oversensitive” patients (on average, one out of 10,000 patients), this person can develop symptoms of liver damage, which vary from mild, transient liver disease to severe organ dysfunction, ending with ALF . As shown in several clinical studies, individual susceptibility to drugs depends not only from the presence and activity of genes participating in the metabolism of xenobiotics but also from functional activity of other genes regulating protective (primarily immune) systems of the organism . Another reason for the development of ALF is intentional or accidental overuse of the drug by “normal”, non-“oversensitive” individuals. The most clinically significant drug in this category is acetaminophen (APAP, panadol, tylenol, paracetamol). For example, in the United States 78,000 cases of acetaminophen overdose and about 500 deaths are recorded annually . The hepatotoxicity caused by the overuse of acetaminophen is the most common cause of ALF and accounts for about 50% of all clinical cases . In animal models, ALF caused by the hepatotoxic effect of acetaminophen was effectively treated with transplanted stem cells [5, 6]. In a number of studies, MSCs have been shown to possess anti-inflammatory, anti-apoptotic and proliferative effects in the liver [7, 8]. The mechanism of the healing effect of MSCs on the liver is disputed. Several studies indicate that the tissue regeneration is significantly enhanced after stem cell transplantation, the effect being primarily attributed to various paracrine factors released by MSCs. Thus, it was shown that the treatment of the liver with pre-conditioned medium obtained from cultivated MSCs is only marginally inferior to the application of proper MSCs . It should be noted, that MSCs are by nature very sensitive to changes of oxygen concentration because of hypoxic conditions in their habitat, bone marrow. Therefore, as an approach of improving clinical effectiveness in the transplantation of MSCs for the treatment of ALF, careful selection of cultivation conditions in vitro, especially the level of O2 and CO2, is desirable. CD-1 male mice (body weight 20–22 g) were kept in the animal facility of the Institute of Cell Biophysics RAS (Pushchino, Russia). Animals were given food and water ad libitum: 24 h before treatment with acetaminophen and MSCs they received only water. The maintenance and treatment of laboratory animals was done in accordance with the European Convention for the Protection of Vertebrate animals used for experimental and other scientific purposes (No. 123 of 18.03.1986, Council of Europe) and the Guidelines for working with laboratory animals in the Institute of Cell Biophysics (No. 39 of 30.12.2018, ICB Russian Academy of Sciences). Primary MSCs were extracted from femur bone marrow of CD-1 mice under general anesthesia. The mononuclear fraction of bone marrow cells was isolated by centrifugation in a density gradient of Lympholyte-H (Cedarlane, Canada). The resulting suspension of mononuclear cells was transferred to Petri dishes and cultivated in Dulbecco’s Modified Eagle’s Medium (DMEM) containing 10% fetal calf serum (DMEM-FCS). To confirm that the isolated primary cells possess the properties of MSCs, their ability to undergo osteogenic, chondrogenic and adipogenic differentiation was checked by conventional methods . Osteogenic differentiation was performed in DMEM-FCS with 100 µM dexamethasone, 0.1 mM ascorbic acid and 10 nM β-glycerophosphate and confirmed by the presence of alkaline phosphatase (AP) in cell culture using AP detection kit (Sigma-Aldrich). Chondrogenic differentiation was done in DMEM-FCS with 100 µM of dexamethasone and 0.1 µg/ml TGF-β and confirmed by staining with alcian blue. Adipogenic differentiation was checked in DMEM-FCS with 10 µM dexamethasone, 10 µg/ml insulin, and 100 µg/ml of 3-isobutyl-1-methylxantine (IBMX) and confirmed by staining with Oil Red-O. The cultivation of the cell monolayer prepared from suspension of primary MSCs was performed either under the conditions of normoxia (21% O2, 5% CO2) or hypoxia. For each condition, after the monolayer formation was completed, the medium was exchanged with fresh DMEM-FCS and monolayer was cultivated for 3 days; the culture medium was then harvested and combined with soluble fraction of cell lysate prepared by ultrasonication of respective MSCs monolayer. The resulting conditioned media obtained from MSCs cultured in conditions of normoxia (NC-MSCs) or in hypoxic conditions (HC-MSCs) were sterile filtered and used for animal experiments. CD-1 male mice weighing 20–22 g were divided into two groups. Animals in both groups were intraperitoneally administered with 350 mg/kg acetaminophen. Then animals in control group (group No.1, n = 15) received 0.5 ml of pure DMEM-FCS, whereas animals of experimental group (group No.2, n = 15) were administered with 0.5 ml of NC-MSC or HC-MSC compositions (protein concentration 10 mg/ml). Materials for histological examination were taken from animals after 4, 24 and 48 h after injection of acetaminophen. For the assessment of morphological changes, paraffin sections (0.3 µm thick) were prepared from liver fixed in buffered 10% formalin. Assessment of dystrophic and necrotic changes in the liver was determined by a blind semi-quantitative method and expressed in points , using a matrix of 10 fields of view. Scores were assigned as follows: 0 – no change; 0.5 – degenerative changes of less than 1/3 of the hepatocytes; 1 - more than 1/3 hepatocytes damaged; 2 - more than 2/3 hepatocytes damaged; 3–100% hepatocytes damaged; 4 – drug combination dystrophy with sporadic focal necrosis; 5 – extensive focal necrosis. When scoring, biopsy specimens taken from six animals in each of two groups were studied. The level of liver enzymes aspartate transaminase (AST) and alanine transaminase (ALT) in serum was determined by kinetic method on the biochemical analyzer “Olympus AU2700” (Beckman Coulter, USA). The biochemical effect of the NC-MSC and HC-MSC compositions was evaluated as a function of the level of ALT and AST in the serum of treated animals after different time intervals (4, 24, 48 h). The level of ALT and AST determined in intact animals prior to the administration of acetaminophen was used as a control. The level of cytokines and growth factors were determined using ELISA kits from R&D Systems. For the LC-MS/MS analysis of the whole-cell proteome, harvested cells were washed with fresh DMEM to remove the excess of FCS. Protein samples were precipitated with four volumes cold acetone overnight at − 20 °C. Pellets were re-dissolved in 8 M urea with 50 mM ammonium bicarbonate, the samples were then reduced by incubation with 10 mM dithiothreitol (30 min at RT) and alkylated with 20 mM iodoacetamide (30 min at RT). The remaining iodoacetamide was quenched with 5 mM dithiothreitol, the samples were then diluted to reduce the urea concentration to 1 M. 2 µg trypsin (Trypsin Gold, Promega) was added to each sample. The samples were incubated overnight at 37 °C, the reaction was stopped with 1% trifluoroacetic acid and the peptides were desalted using C18 SepPak columns (Waters) according to the manufacturer’s instructions. Peptides were separated on the Ultimate 3000 RSLC nano-flow chromatography system (Thermo-Fisher), using a pre-column for sample loading (Acclaim PepMap C18, 2 cm × 0.1 mm, 5 µm, Thermo-Fisher), and a C18 analytical column (Acclaim PepMap C18, 50 cm × 0.75 mm, 2 µm, Thermo-Fisher), a segmented linear gradient from 2 to 80% solvent B (80% acetonitrile, 0.1% formic acid; solvent A 0.1% formic acid) at a flow rate of 230 nL/min over 240 min was applied. Eluted peptides were analyzed on a Q Exactive Plus Orbitrap mass spectrometer (Thermo Fisher), which was connected to the column with a Proxeon nano-spray-source (Thermo Fisher) using coated emitter tips (New Objective). Raw data were processed using the MaxQuant software package (version 1.5.3.12)  and the Uniprot mouse reference proteome (http://www.uniprot.org) as well as the database of most common contaminants included in MaxQuant. The search was performed with full trypsin specificity and a maximum of two missed cleavages at a protein and peptide spectrum match false discovery rate of 1%. Carbamidomethylation of cysteine residues were set as fixed, oxidation of methionine and N-terminal acetylation as variable modifications. For label-free quantification (LFQ) the LFQ function  and “match between runs” were activated—all other parameters were left at default. MaxQuant search results were further processed using the Perseus software package . Contaminants, reverse hits, proteins identified only by site, and proteins with less than two razor peptides or less than two MS/MS counts were removed. The log2 transformed LFQ values were used for relative protein quantification. Proteins with missing LFQ values, representing low abundant and low coverage hits, were removed from further analysis. GO terms and the log2 LFQ difference (hypoxia – control) was used to calculate a 1D annotation enrichment in Perseus . Statistical data analysis was performed using Statistica 6.0. For nonparametric data, the U-Mann-Whitney test was used. The differences were considered statistically significant when p < 0.05. Administration of acetaminophen leads to profound changes in the central parts of lobules. After 4 h, one-half to two-thirds of the lobule is spanned by the field of damaged hepatocytes in the form of severe protein and fatty degeneration and necrosis of individual cells or groups of them (Fig. 1a). Furthermore, the necrotic cells, surrounding central veins, reveal significant destruction of cellular membranes, phenomena of karyopyknosis and karyorrhexis as well as changes of the trabecular structure in the liver tissue up to fully discomplexed hepatocytes. The central veins and adjacent sinusoids become sharply dilated and filled with erythrocytes or plasma. One day after the acetaminophen administration (Fig. 1b, c), a pronounced fatty and protein dystrophy of hepatocytes, resulting from the damage of their nuclei in the form of margination of condensed chromatin, is identified across the whole area of the lobules. The least damaged cells are present in areas closed to the portal tracts. The tissues surrounding central veins display hydropic degeneration of hepatocytes with focal vacuolization and lysis of the cytoplasm, disintegration of cell membranes and destruction of nuclei (karyorrhexis, karyopyknosis, karyolysis). 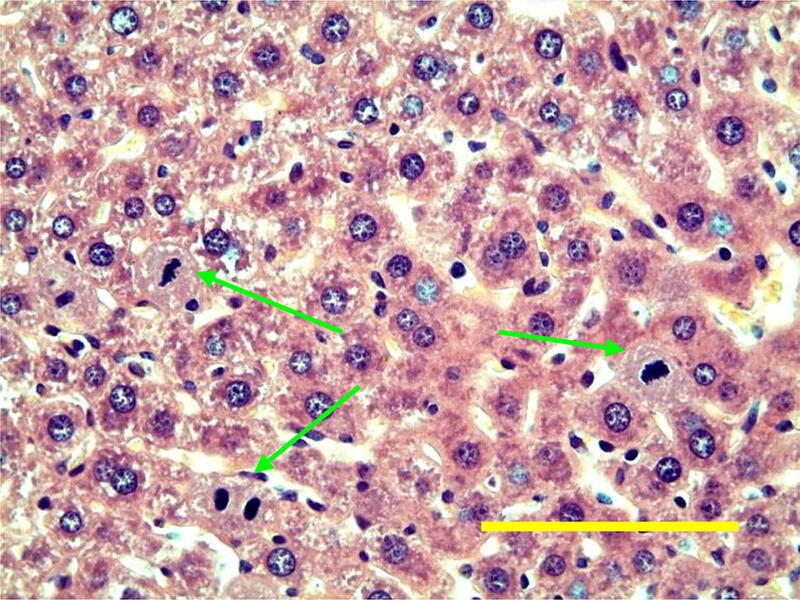 The areas containing necrotic hepatocytes are marked by the inflammatory infiltration with a predominance of polymorphonuclear leukocytes and the presence of macrophages (possibly due to the proliferation of Kupffer cells). The accumulation of polymorphonuclear leukocytes was also noted in the lumen of some central veins along with pronounced discomplexation of hepatocytes. However, in the vicinity of the portal tracts, some preserved areas of the trabeculae are revealed. Two days after the administration of acetaminophen (Fig. 1d), a widespread discomplexation of hepatocytes is revealed in the liver tissues. Trabecula sites are identified only near some of the portal tracts. In hepatocytes, a pronounced large - and medium-drop fatty degeneration of cells predominates and margination of chromatin, most developed in the central parts of the lobules, occurs. Only hepatocytes closed to the portal tract remain minimally damaged. Inflammatory infiltration is insignificant at this point and is mainly determined near portal tracts. In the lobules, expanded sinusoids are noted. The administration of MSCs compositions into animals largely improved the histological picture of the hepatic tissue. 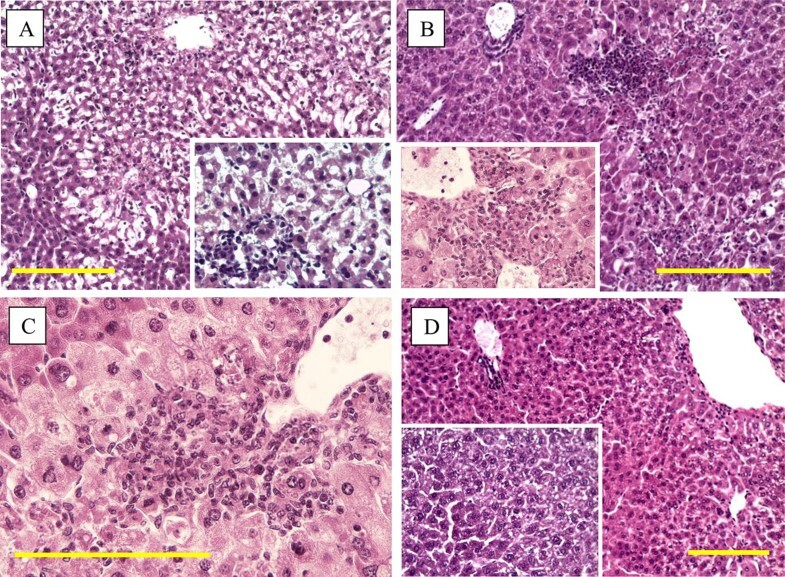 Within 4 h after acetaminophen administration, the detected liver tissue lesions in MSC-treated animals are significantly less than in the control group. Thus, 4 h after the simultaneous administration of acetaminophen and NC-MSCs (Fig. 2a), the liver segments still retain a trabecular structure. There are no signs of venous plethora and inflammatory infiltration. On the other hand, the swelling of endothelial cells of sinusoids was noted. The hepatocyte lesions do not have a distinct zonality and consist in dystrophic changes in the cytoplasm in the form of protein and small droplet fatty degeneration. In a few cells, the destruction of the cytolemma was noted. However, throughout the area of the lobules, a few hepatocytes with large hyperchromic nuclei containing fine dispersed chromatin and binuclear cells were identified. The histology status was further improved when the HC-MSC composition was injected to animals (Fig. 2b). After 4 h, acetaminophen-induced damage to the hepatic tissue remains minimal. There was a violation of the trabecular structure of the lobules with focal discomplexation of hepatocytes. Pulmonary and small droplet fatty degeneration of hepatocytes, mainly around the central vein or in the 3rd zone of the acini, where cell obesity acquires a large droplet character was detected, but there were no signs of circulatory disturbance and inflammatory infiltration. In the sinusoids, the number of Kupffer cells is increased, which may be an indirect sign of their proliferation. In hepatocytes (without pronounced zoning), large hyperchromic nuclei containing fine dispersed uniformly distributed chromatin and damaged nuclei alternate with coarse dispersed chromatin with a tendency to margination. Margination of chromatin is most noticeable in cells surrounding the central veins and in the 3rd zone of the acinus. Twenty-four hours after the joint administration of acetaminophen and NC-MSC (Fig. 2c), an increase in the degree of hepatocyte damage is observed in comparison with the 4-h exposure period, however, the severity and prevalence of dystrophic changes are significantly less than in the control group. The trabecular structure is preserved in the periportal zones of the lobules. There was no stagnant plethora. In the centrolobular areas, pronounced tissue lesions in forms of protein, large-droplet fat and hydrophilic degeneration, up to partial and monocellular necrosis of hepatocytes or their groups, were observed. In areas of necrotic changes, insignificant infiltration of polynuclear leukocytes and macrophages can be seen. When the HC-MSC composition was administered to acetaminophen treated animals, the degree of liver damage was also increased at 24 h relative to 4 h (Fig. 2d). The damage varies from animal to animal but one can distinguish the following common features: the trabecular structure of the lobules is preserved (discomplexation occurs only in the centrolobular zones of individual lobules). A large-droplet fatty degeneration of hepatocytes and monocellular necrosis is also seen. The nuclei of the cells of this zone are marked by the margination of coarse dispersed chromatin. In other parts of the lobules, there are binuclear cells, hepatocytes with large hyperchromic nuclei, rich in uniformly distributed fine dispersed chromatin, and single mitoses, but no signs of inflammatory infiltration and blood circulation disturbances were observed. Forty-eight hours after the injection of the NC-MSC composition and acetaminophen (Fig. 2e), a distinct recovery of damagedF tissues is observed. The trabecular structure of lobules was preserved and no necrotic hepatocytes were observed. Dystrophic changes in the form of protein, medium- and large-droplet fatty degeneration were, in this case, most pronounced in the centrolobular regions and in the 3rd zone of the acinus. The margination of coarse dispersed chromatin predominates in these cells, but there is no inflammatory infiltrates and disturbance of the blood circulation. At the same time, the number of cells with large hyperchromic nuclei containing uniformly distributed fine dispersed chromatin and binuclear cells was increasing. A remarkably different effect was observed for the HC-MSC composition injected along with acetaminophen (Fig. 2f). Forty-eight hours after the injection, the trabecular structure of the liver tissue was preserved and there were no morphological changes in blood vessels. Small-droplet fatty degeneration of hepatocytes was noted mainly in the centrolobular and periportal zones and no damage to the nuclei was detected. On the contrary, the number of cells with large hyperchromic nuclei and binucleated hepatocytes was increased (Fig. 3), suggesting increased protein-synthetic activity. The effects described above are summarized in the Table 1. Thus, the administration of acetaminophen causes pronounced damage to the hepatic tissue already within the first hours after injection. After 24 h, the level of damage is reduced and by 48 h there is a reliable recovery in control animals in comparison with the initial period. When an animal received an MSC composition along with acetaminophen, a reliable protective effect is observed within the first 24 h. It should be noted that the compositions obtained from cells cultivated under the conditions of reduced oxygen content (HC-MSCs) have a more pronounced effect during the first 24 h, but when used in 48 h, a significant increase in the number of dystrophically altered hepatocytes is observed. 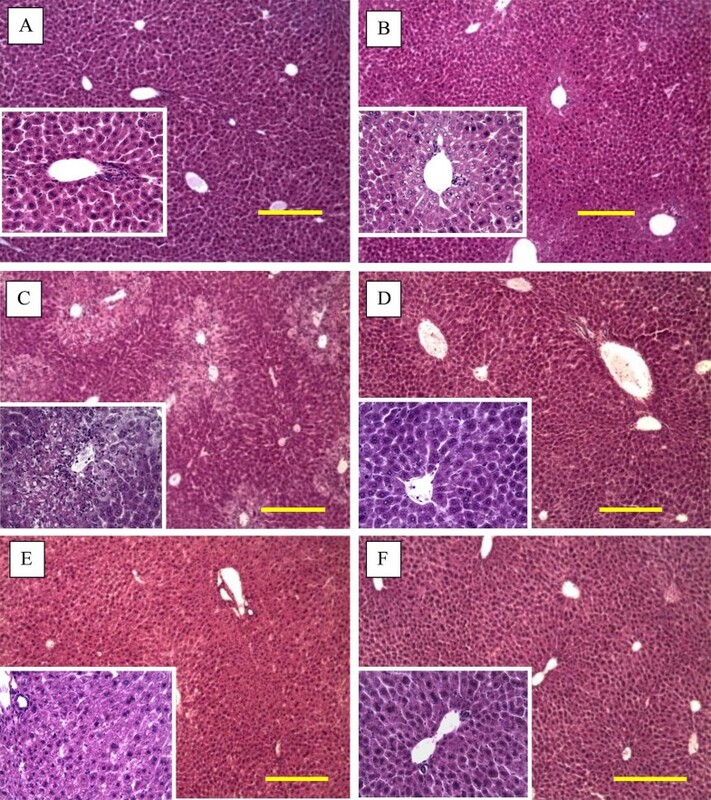 The data from the biochemical tests of common serum liver enzymes, ALT and AST, showed that the MSCs compositions, when administered in the early acute period of liver damage, significantly reduce the level of liver enzymes, the protective effect being especially noticeable at earlier stages of liver damage in animals treated with HC-MSCs (Fig. 4). Thus, 4 h after administration of acetaminophen, the mean concentration of ALT in the control group (animals treated with acetaminophen but not received any of C-MSC composition) was 2492,0 ± 203,0 IU/l, in the NC-MSC-treated animals it consisted of 223,2 ± 8,4 IU/l, and in the HC-MSC-treated animals the ALT concentration dropped to 48,3 ± 15,8 IU/l, the last value is close to the ALT level in intact animals. The mean concentration of AST, 4 h after acetaminophen administration, was 1213,5 ± 101,3 IU/l in the control group, 98,5 ± 15,1 IU/l in HC-MSC group, and 621,4 ± 23,1 IU/l in the NC-MSC group. It should be noted that the values of AST and ALT in the HC-MSC group was significantly lower than the level of enzymes in the NC-MSC group. After 24 h, the enzyme levels in the control group decreased, but still considerably exceeded the mean ALT and AST concentrations in non-ALF animals. At the same time, the levels of ALT and AST in the HC-MSC group increased as compared to those levels in control animals and NC-MSC group. One of the possible explanations is that the hypoxic environment forces MSC to produce active substances that inhibit the inflammatory process for a while. When the anti-inflammatory agents are inactivated in the liver tissue, the inflammation continues to develop. This is also evident that after 24 h, the liver enzyme levels remained significantly elevated in the control group, and, contrary, the level of enzymes in the group, which was treated with C-MSCs was approaching normal values. After 48 h the values for AST and ALT concentrations in two groups are aligned, however, the level of AST remained elevated in all groups. During cultivation in DMEM-FCS, MSCs enrich culture medium with various cytokines and growth factors. Here, to test the differences between biological compositions prepared from cells cultivated at normal O2 concentration (21%) and cells grown in moderate hypoxic conditions (10% O2), we determined the concentration of several cell signaling factors in both NC- and HC-MSC variants. As follows from data presented in Table 2, the low level of O2 leads to an increase in the production of the signal molecules relevant to hypoxia. The data from three independent experiments with five individual repeats in each are summarized. In order to elucidate the difference in the proteome of normal and hypoxic cells and possibly to identify individual proteins which differ in both MSC sources, we further analyzed the protein distribution pattern in whole cell lysates prepared from normoxic and hypoxic MSCs. 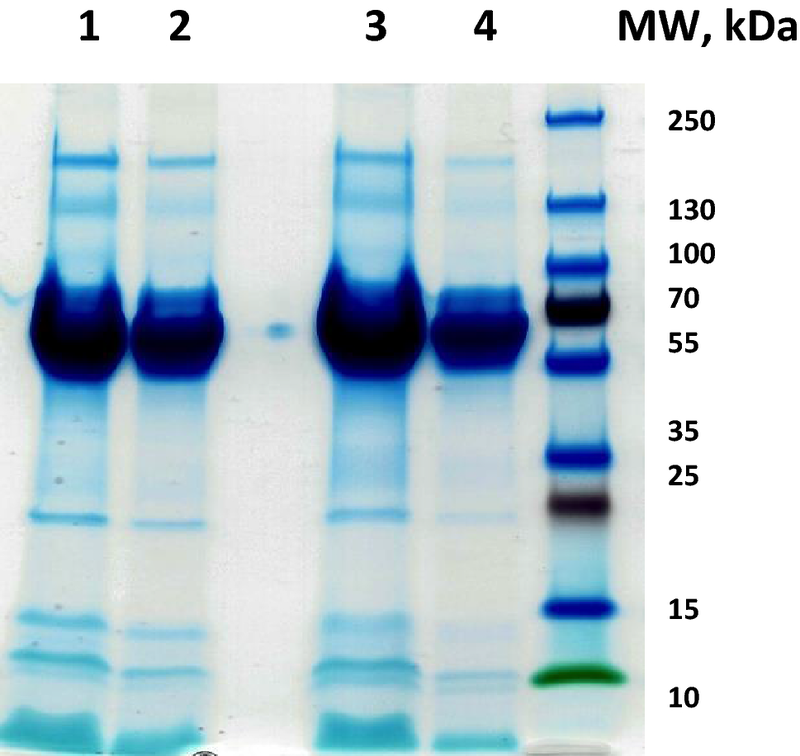 The SDS–PAGE of MSCs compositions revealed only subtle differences in the intensity of protein bands in the area of gel corresponding to 15–20 kDa, the protein bands here being still well resolved (Fig. 5). The area above 30 kDa in samples of cells grown in DMEM-FCS has a fuzzy background and poorly resolved protein band pattern on a gel because of the presence of abundant DMEM-FCS proteins, e.g. BSA and immunoglobulins, making impossible the accurate identification and quantification of protein bands derived from cells. Nevertheless, the observation in SDS–PAGE gels of small differences between the samples in Coomassie-stained bands at 15–20 kDa suggested potential proteome changes in MSCs upon hypoxia, which were confirmed by LC-MS/MS analysis of whole cell lysates, as described below. To investigate the effects of hypoxia on the protein distribution in MSCs, we used a shotgun proteomics approach applied to whole cell lysates. We digested whole extracts of HC-MSCs prepared from cells grown at 10% and 5% O2 and compared their protein expression pattern with control NC-MSC digests. The same 10% O2 samples were used to treat experimental animals, so the liver-regenerating potency of the samples was confirmed and consistent with histological and biochemical results presented above. In our pilot study we were able to identify more than 2600 proteins and we acquired relative quantitative information for more than 1900 proteins using label-free quantification (summarized in supplemental proteomics data table and figures S1A and S1B). This experiment represents data from single sample replicates with confirmed biological activity and, thus, we did not compare the data on the level of individual proteins but rather assumed that general trends in differential expression might be observable when analyzing the data on a functional level. In a 1D-annotation enrichment analysis on the log2 protein ratio using gene ontology terms a number of differentially enriched functional categories emerged which suggest adaptive gene regulation in response to different oxygen concentration in the cell cultures (Table 3). This spot-check probing the MSC proteome suggests complex differences between proteomic fingerprints of normal and hypoxic cells. Although the identified proteins belong to different functional classes or clusters, their overall pattern suggests that, besides changes in the expression pattern of proteins responsible for intracellular transport, energy metabolism and respiration; the differences in the amount of protein-modifying enzymes, transcriptional factors and various intra- and inter-cellular signal molecules, caused by cultivation at low oxygen, might contribute to the healing effect of MSCs compositions in liver. The positive effect observed in MSC transplantation on models of acute renal and hepatic insufficiency, ischemia–reperfusion injury of various organs, burn lesions, and pulmonary edema has been repeatedly confirmed [16, 17, 18]. At the same time, positive clinical effect in MSCs transplantation is typically observed during first hours after administration, thus, indicating that the effect apparently does not depend on the structural changes in tissues caused by transplanted cells, but depends primarily on the paracrine factors including cytokines and growth factors produced by cells and/or short sections of RNA that also have a pronounced regenerative effect [17, 19]. However, the level of production of cytokines and growth factors is strongly influenced by conditions of the MSCs’ microenvironment. With the decrease in the level of O2, cells begin to actively express the hypoxia inducible factor (HIF), which is one of the key transcription factors involved in the adaptation of MSC to decreased oxygen content. This factor is inactivated with increased oxygen concentration and its content remains stable under hypoxic conditions . Activation of HIF products triggers the transcription of angiogenic genes and stimulates MSC to produce other biologically active molecules such as VEGF, FGF, HGF, IGF, etc. [20, 21, 22, 23]. Cultivation conditions significantly influence the production of cytokines and growth factors released by stem cells. Other studies showed a positive effect on the differentiation, lifespan and anti-inflammatory characteristics of MSCs cultured at physiological oxygen level (from 1 to 7% oxygen) [24, 25]. In this work the effect of oxygen concentration in the culture medium was studied and the results confirmed the hypothesis that the interplay of paracrinic factors released by MSCs and extracellular signaling during tissue regeneration with transplanted stem cells is important. The results of the qualitative and quantitative analyses of MSCs compositions suggest differences in protein expression pattern between NC-MSCs and HC-MSCs which may contribute, as single components or in combination, to the therapeutic and healing effects of MSCs. The majority of proteins enriched in HC-MSCs are involved in intracellular transport and cellular respiration. These differences could be well explained by the adaptation of cells to low oxygen concentration and changes of intracellular pH in response to oxidative stress. On the other hand, the enrichment of proteins belonging to other protein groups, in particular to receptor complexes, seems to be rather specific and relevant to such effects. Remarkably, by analysis of the whole hypoxic MSC proteome we observed significant enrichment in the groups of proteins which belong to the respiratory supercomplex localized in mitochondria , e.g. NADH dehydrogenase complex (complex I), respiratory complex III (also known as cytochrome bc1 complex or cytochrome c oxidoreductase) and ATPases (complex V). Higher supplement of these red-ox proteins can potentially contribute to protective effect of MSCs, particularly enhancing the utilization of ROS in damaged tissues and protecting membrane integrity. It was shown that disintegration of respiratory chain or its functional deficiency play role in both, p53 and MAPK apoptosis signaling pathways [27, 28]. Deficiencies in the regulation of respiratory chain promote the permeabilisation of cell membranes, which, in turn, leads to the accumulation of oxidized form of cytochrome c in cytoplasm and activation of pro-apoptotic events [29, 30]. Cytochrome c oxidoreductase, which was found in higher proportion in hypoxic MSCs, can compensate rapid release of oxidized cytochrome c in damaged liver cells by keeping cytochrome c in predominantly reduced state. The impact of redox status of cultured stem cells can nonetheless be not necessarily restricted to the tissue regeneration effects described in this paper. The proteomics results should be regarded as preliminary observations and future quantitative studies will certainly help to reveal the MSCs responses to hypoxia in more details. One can suggest that MSCs that have been exposed to hypoxia produce significantly more biologically active molecules, including, but not limited to cytokines, growth factors and receptor proteins and, thus, they can be useful to prevent and reverse necrotic changes in liver caused by pharmaceuticals including acetaminophen. Although the clinical relevance of the role of MSC proteins in liver regeneration remains to be studied, this work provides a conclusive proof for the idea to use protein subsets extracted from cultured MSCs instead of transplanted primary MSCs, to cure liver damage caused by ALF. Such approach would potentially facilitate the treatment and reduce the risk of adverse physiological reactions caused by an injection of whole cells. Furthermore, systematic proteomic and metabolomics studies will help to understand the mechanisms of the protective and healing effect of MSCs compositions on damaged liver tissue and identify corresponding lead molecules. The biochemical and histological experiments conducted in this study showed that the MSC protein compositions significantly inhibit the level of inflammatory reaction and reduce the area of hepatocyte necrosis in the first 24 h. Results of mass-spectrometry analysis done on the MSC protein compositions confirm that the amount of oxygen available to growing cells considerably affect their proteome. Open access funding provided by Institute of Science and Technology (IST Austria). The work was done with the support from the Austrian Federal Ministry of Economy, Family and Youth through the initiative “Laura Bassi Centres of Expertise” funding the Center of Optimized Structural Studies, grant No. 253275, and from the Russian Basic Research Fund, grant No. 17-07-00439. Authors thank Dr. James A. Letts for discussion and critical proofreading of the manuscript. We would also like to thank the MFPL Mass Spectrometry Facility at the Campus Vienna Biocenter for excellent technical and scientific support for proteomics experiments, and the VBCF for providing the MS instrument pool. AAT performed cultivation of mesenchymal stem cells and preparation of cell compositions. ANS carried out experiments with laboratory animals. KAR participated in the design and validation of histology experiments. EVK carried out biochemical tests. AC performed sample preparation for mass-spectrometry analysis of MSC compositions. MH performed mass-spectrometry analysis of MSC compositions, validated proteomics data and helped to draft the manuscript. KD-C supervised proteomics experiments, and participated in their design and coordination. AAT and AC conceived of the presented idea and drafted the manuscript. All authors read and approved the final manuscript. The studies were supported by the Austrian Federal Ministry of Economy, Family and Youth through the initiative “Laura Bassi Centres of Expertise” funding the Center of Optimized Structural Studies, grant No. 253275, and by the Russian Basic Research Fund, grant No. 17-07-00439. Authors declare that none of them has any conflict of interest or financial arrangements that could potentially influence the described research. The maintenance and ethical treatment of laboratory animals was done in accordance with Guidelines of the European Convention for the Protection of Vertebrate animals used for experimental and other scientific purposes and the Laws of Russian Federation. The studies were performed in mice and did not involve any human participants, human data or human tissues.